Celebration Day for The Shoal! Seaford Town Council is excited to spread the word that Bank Holiday Monday, 28th May, is going to be a special day for Seaford! Further to the installation of its final phase, you are invited to share in a Community Celebration at The Shoal, Seaford’s magical community mackerel bench overlooking the sweeping Seaford bay from the Splash Point pier, now adorned with hundreds of your sponsorship fish on display. This unique sculptural seating experience, created by metal magician Christian Funnell and inspirational gardener Gabby Tofts has already become a favourite destination for locals and visitors. The Celebration will pay tribute to the hundreds of loving sponsors, whose generosity has made this project possible. The Town Council hopes you will all be there on the 28th May so that the Council can say 'Thank You' to all those who made the project possible and for those with sponsored fish to share their sponsorship stories. The event will start at 11.30am with Seaford's popular 'Pop Ups' singing some favourite foot-tapping sing-along tunes. Have you ever eaten from a Vintage Horse Box? Try the scrumptious gourmet fish and chips from Seaford's 'Salty Sea Horse'. Wash that down with a Shoal Celebration Drink at the Classic Bar Box and indulge in a yummy crepe from Le Creperie Stall! 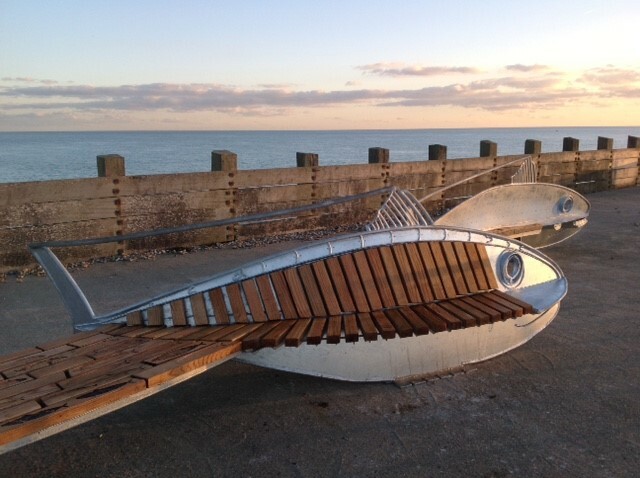 The grand opening of the completed Shoal bench at 12 noon will be followed by more musical entertainment with Seaford Silver Band and a chance to sing along to 'Sussex By The Sea'! Are you a local crafter or a small local business who would like a pitch at the celebration event for The Shoal Community Bench? If so, the Town Council would like to hear from you. Please contact the Council at facilities@seafordtowncouncil.gov.uk or call 01323 894870 for further information. Come and join in at The Shoal, Splash Point Jetty, 28th May for a super Sussex Celebration by the Sea!